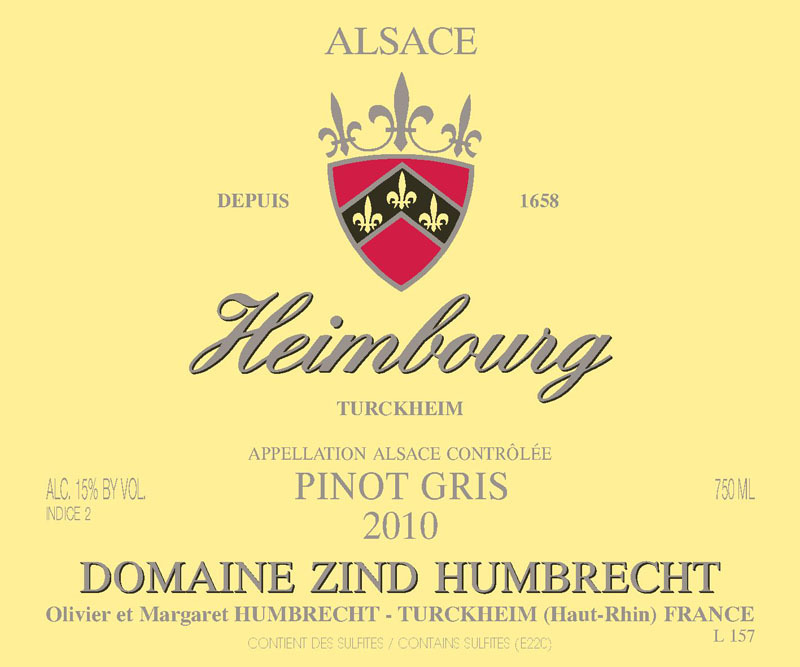 We chose to plant Pinot Gris on the top part of the Heimbourg vineyard. There, the soil is much poorer and thinner and the effect of the active lime is stronger (pH of the soil 3 feet deep is around 9/9.5). It is also more windy and exposed to colder temperatures, which is actually interesting for this grape as it stops them to botrytise to early and also keeps better acids in the grapes. As the botrytis was slow to start and the grapes showed excellent phenolic ripeness, we decided to harvest them before sugar content would soar too much. In 2010, we were also concerned by the very small crop that would even be more reduced if harvested too late. The fermentation was excruciatingly slow and we wondered if this wine would ever stop fermenting! Finally, around October 2011, it was finished and we were surprised to see how far it went. The Heimbourg is still a relatively young vineyard, but year after year, it shows its potential to become one day a top vineyard in Turckheim. 3/2012: the Heimbourg vineyard is recognisable for its very aromatic, fruity style, often mixed with candied or dry fruits. In 2010, there is also a strong fermentation character on the nose: lots of nutty, vanilla, crème brulée aromas. These are purely the effect of long lees contact, there is no new oak! The palate is slightly round or gentle. The finish is long, quite aromatic and expressive. The small residual is well integrated and participates to the velvety touch.